A UK pianist playing on a hillside in Kanchanaburi province to old and disabled elephants has become a You Tube star with millions of views and hundreds of thousands of subscribers on the channel. Thailand has long had a special association with the elephant. This story will help you understand why. A classically trained UK pianist has made a name for himself in Thailand’s Kanchanaburi province and worldwide online by playing to old elephants. A few times a week at a sanctuary, he transports his upright piano up the hills to entertain his new four legged fans. The 57 year old man feels that he has developed an emotional and spiritual bond with the majestic creatures, many of whom are injured and disabled after a lifetime of abuse. Video footage and recordings of the UK pianist have become hugely popular on YouTube with millions of views. It comes at a time when elephant populations in Thailand are showing tentative signs of recovery. The elephant is Thailand’s national symbol and has been associated with the country for thousands of years. UK man Paul Barton made it his mission to play a number of times every week to old and injured elephants living in an elephant sanctuary on the hills in Kachanaburi province. He dragged his upright piano up there each time to do it. He was s struck immediately when one old elephant stopped eating to listen to his music on one of his first recitals. Thereafter, he felt a bond with the elephants who seemed to be deeply impacted by the music. The recitals featured on videos are now published on You Tube where they have drawn millions of views and Paul’s channel has over two hundred thousand subscribers. An English pianist living in Kanchanaburi province has been making a name for himself serenading elephants at a local elephant retirement sanctuary with classical music from his piano. His love and bond with the animals is touching and brings to life a common and powerful spiritual bond. The videos of the concerts posted on YouTube have received millions of views and hundreds of thousand of subscribers. Many of the elephants are old and injured after many years of hard work in Thailand’s forestry and even tourist industry. 57 year old Paul Barton has made it his special mission to play to them after noticing that the elephants appeared deeply impacted by the music after he managed to haul his piano into the mountains and set it up there to play for them. 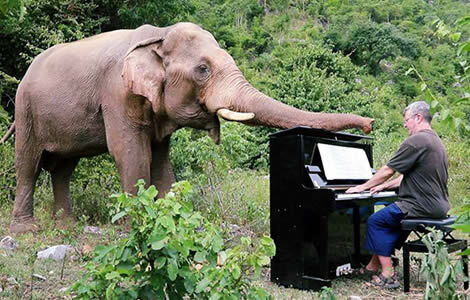 He is reported to have been stunned the first time he played the piano in the open to the elephants when a blind and sick elephant named Pla Pla just stood in front of him listening. It was breakfast time and the elderly elephant stopped eating, so deeply was he impacted by the music. Paul recalls that he was ‘listening to the music with grass protruding from his mouth’ and that one incident convinced him that his open air recitals for the animals was worthwhile. The videos of the recitals are impactful. The peace and quiet of the sloped hills with the sound of nature in the background and the old graceful creatures seems to chime with Paul’s beautiful music. Alas, the story of Pla Pla did not end happily. The old elephant had been abused by his former owner who removed the animal’s tusks to sell them on the market. He was left in pain after a bacterial infection developed in the unhealed wounds left behind where his tusks should have been. ‘I like to think that the soothing music gave him some comfort in the darkness,’ says the clearly sensitive pianist who trained at the London Academy of Royal Arts. Several times a week, Paul transports is upstanding piano up the mountain at Kanchanaburi Elephant World, a retirement sanctuary for elderly elephants in a beautiful area of Kanchanaburi province on Thailand’s border with Myanmar. Paul plays classical music and favorites to the elephants who stand around eating or simply listening to the peaceful and uplifting music. Paul is convinced that the beautiful creatures appreciate the music and seem to find solace in his playing. Elephants are reported to be very emotional creatures and have an uncanny memory so that they can recall the scent of a person and recognize that person long after as a friend. Paul likes to think he is a friend to these animals. The elephants at the sanctuary are often injured or suffering from some disability. Paul’s story has been reported by the international foreign news agency Reuters. He has made videos which show the elephants surrounding his piano and even at times reaching out with a trunk to see how the music is made on the keyboards as he plays. ‘I hope that music like this will be part of a process of rehabilitation for elephants that have had stressful lives,’ Paul says. The elephants are well treated at Elephant World which is a beautiful environment for them. They receive enough food and treatment for various injuries and physical problems. Paul hopes that his music is a sort of a mental health treatment for the animals, many of whom have worked for over 50 years before coming to the sanctuary. ‘Maybe some of these blind elephants get a little bit of comfort from hearing pieces of soothing classical music occasionally,’ he says. In one of Paul’s videos, a 65 year old female elephant named Lam Duan and who is also blind, stands contented eating her lunch and listening to Paul’s rendition of Silent Night. Many of the elephants have had hard and injurious lives. Animal rights campaigners believe that nearly 80% of the reported 3,000 elephants believed to be employed in tourism related venues in Thailand and Southeast Asian countries are treated poorly and worked too hard. In Thailand alone, there are 3,000 elephants held by human beings and put to work in a variety of areas. Elephants are costly to keep and it is thought that this pressure makes it difficult for owners to always consider the welfare of the animals. Many work in tourist related and associated ventures in Thailand. There are sometimes reports in Thailand of elephants becoming crazed and attacking their owners with some incidents proving fatal. The use of elephants in Thailand for logging work in the forestry business was made illegal in 1989 but some elephants are still alive from that time. It is reported that elephants take 10 years to train from the wild and that this process particularly cruel as it involves breaking the will of the majestic animal. However as the Kanchanaburi sanctuary shows, not all elephants in Thailand are treated badly. In some Thai provinces such as Uthai Thani, Tak and Kanchanaburi itself there are reports of an increase in the population of wild elephants. Many elephants in Thailand now live freely in beautiful national parks where they are protected. Also some of the tourist venues in Thailand that use elephant treat the animals very well. A notable few operate to high ethical standards respecting the dignity and welfare of the animals. Elephants are loved in Thailand and are the country’s national symbol. One of Thailand’s and the world’s most popular beers, an international brand is ‘Chang Beer’ which is the Thai word for elephant. Thai people have a long association with the animal being used for thousands of years as a powerful tool of war and for its strength working in Thailand’s dense forests drawing wood. Even in Buddhist tradition, the elephant is auspicious. The legend is that before Buddha was born, his mother had a dream in which a white elephant delivered to her a lotus flower. The symbol of the white elephant, in fact, adorned the old flag of Siam until 1917 and is still featured on some Thai naval flags and that of Thailand’s consular and ambassadorial service. The Order of the White Elephant, established by King Rama IV is one of Thailand’s most prestigious military and civilian royal orders in Thailand. The white elephant was considered so rare that it was considered royal and never put to work despite the cost of its upkeep. This led to the English expression ‘white elephant’ which means something that is not put to useful work in the material world. Although there are now encouraging signs, the population of Thailand’s elephants dropped dramatically from 100,000 in the 19th century to less than 5,000 with the advent of modern machinery in the 20th century. Today as elephant populations show tentative signs of recovery, there is a newfound love and respect for the animals in a more caring age.